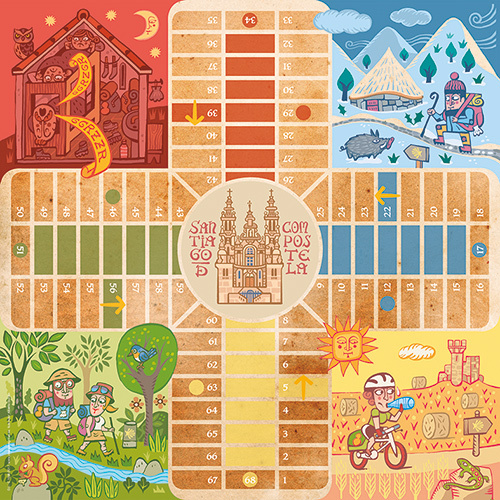 The goose game of the Camino de Santiago is based on the French way. On the board we can see the 63 squares that compose the game. Each one of them represents the peculiarities of each stage; churches, monasteries or the most emblematic landscapes from Roncesvalles to Santiago de Compostela. On the backside of the board are the instructions with a small description of what can be found in each square. These descriptions are translated to Spanish, French, English, German, Italian and Portuguese on the leaflet that accompanies the game. The game comes in a foldable cardboard for an easy transport. 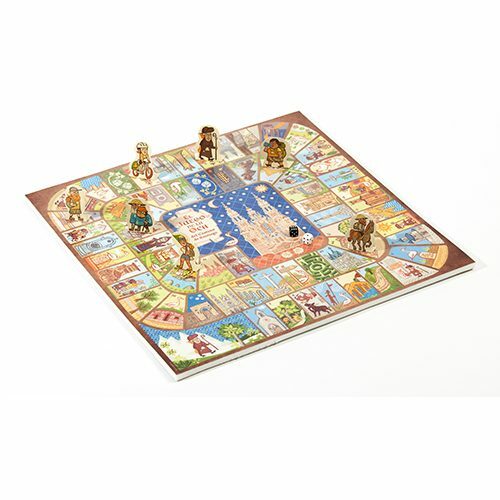 It comes with two dices of different colours and several cut-out figures representing different pilgrims. On the back of the board you will find Ludo of the Camino de Santiago. The four scenes represented in the players’ bases or nests of this Ludo game refer to typical scenes and landscapes of the Way of Santiago: inclement weather, unforgettable landscapes, and even pilgrims’ discomforts. The aim of the players is the same as the aim of the pilgrims, to reach the finish square, to arrive in Santiago de Compostela.